This popular, winter-flowering houseplant, one of the most exotic-looking flowers in the plant kingdom, makes a great addition to nearly any indoor setting by providing a burst of red color for the holidays. Christmas cactus is not only easy to care for but propagates easily too, making it an exceptional candidate for holiday gift giving. 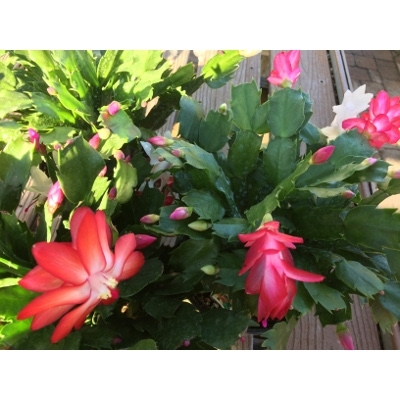 It is Christmas cactus performs well under average home conditions with moderate care. It will adapt to low light conditions, but the plant will produce blooms more readily if exposed to brighter light. That being said, too much direct sunlight can burn its leaves, so keep the Christmas cactus in an appropriate area to avoid this. Christmas cactus moisture is important as well. The plant requires frequent and thorough watering, during its active growth in spring and summer, keeping the soil slightly moist. Allow Christmas cactus moisture levels to drop and dry out some between watering intervals, but never completely, and never let the plant sit in water.